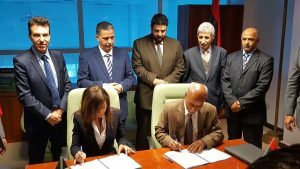 The Libyan Civil Aviation Authority has signed a multi-milltion dinar contract with Italy’s Techno Sky to build a new control tower at Tripoli’s Mitiga airport. The deal signed today in the presence of the Presidency Council’s transport minister Milad Matouk and Italian ambassador Giuseppe Perrone, also covers the renovation of the airport. Signing the agreement for Techno Sky, a subsidiary of Italian air navigation service company ENAV, was ENAV CEO Roberta Neri and for the Civil aviation authority was its chairman Nasreddin Shaib Al-Ein. Last July, ENAV signed an agreement to upgrade and develop air navigation services. At the beginning of last month, officials from both ENAV and Italian civil aviation authority ENAC were in Tripoli to look at security at Mitiga and assess of what is needed in terms of training and equipment.